Home › Bubble map › Got DIY content? It pays to do your homework here! “It pays to do your homework here!” That was one of the headlines used in the first full-page ad placed by the Real Estate Cafe in April 1996. To dramatize that we were turning the real estate industry upside down, you had to turn the newspaper upside down to read the ad. According to an opinion in the Boston Globe last week entitled, The Deflation of Everything, the economic recovery has been hampered by internet-inspired expectations that everything is FREE! “IN CAMBRIDGE last week, Federal Reserve Chairman Ben Bernanke bemoaned high unemployment and low inflation, while promising that the short-term interest rate will remain, in the near term, near zero. This is an outrage to ordinary Americans, who have come to believe that a quarter of a percent is too much to pay for anything. PAY clients for content they create! 2. Second, we’d like to revive our “Tipping Policy” and explore customizing it for some homebuyer clients. As you can read on this blog post in 2006, we offered content creation credits of $25 to $50 for comments, photos and videos that PAYING clients posted to our award-winning Real Estate Bubble Map (now dismantled because the mapping platform is no longer in business). Still, even last week, a fellow real estate licensee asked if our rebate was legal or moral. Perhaps he is unaware of the CNN’s poll that shows that more then 4 out of 5 consumers think agents are overpaid. Or unaware that the Department of Justice has repeatedly said commission rebates are legal, and encouraged the state real estate commissions to remove barriers to competition that ban commission rebates in some states. Thankfully, Massachusetts is not one of them. By partnering with FaveCast for their limited time offer, you don’t need to be a homebuyer or need wait until closing to monetize our Tipping Policy. 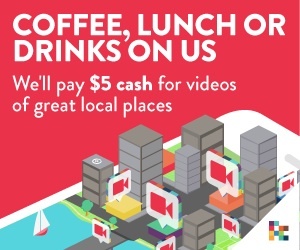 Anyone can begin collecting $5 for each video you create NOW, and another $2 for each friend who creates videos, too. To help spread the word, we’re promoting these financial incentives on Boston.com’s Open House page. If you’d like to know how you can multiply those $5 payments five or tenfold through commission rebate credits, use the link above to schedule a FREE 15 minute consultation and let’s explore what kind of Tipping Policy would motivate you. Generous as that sounds, don’t tell anyone Real Estate Cafe thinks commission rebates are OVERRATED. There are 10 Hidden Costs in Reactive Homebuying process which is why “Pre-bates” are important than rebates, and why we STRONGLY encourage DIY homebuyers to try Proactive House Hunting before they get caught in another bidding war.